15,000 PSI. 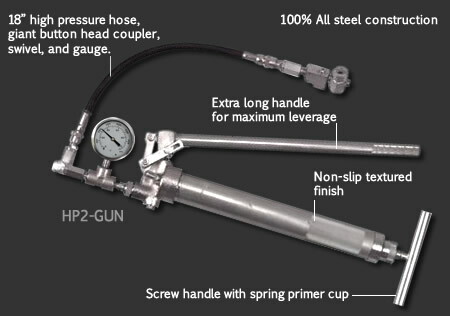 High Pressure Grease Gun, 18" Hose, Swivel, Giant Button Head Coupler, PSI Gauge. Gun is suitable to dispense grease, sealants, fluids, packings, and highly viscous lubricants. Each stroke of the lever provides automatic priming. Replaceable & repairable parts. Equal to Alemite P/N 325540-1. Made in USA!